The Economic Financial Crimes Commission(EFCC) needs a wider scope of operation in Nigeria. One should not be snubbed for suggesting that EFCC should be mandated to look into the ugly scenario in the Nigerian churches. The anti-corruption crusade in Nigeria should not be for Public Office Holders alone. EFCC should be extended to the churches too. Pastors should be made accountable. They should also be made to explain where they get money to buy Jets, Flashy and expensive cars, fat bank accounts, as well as multi-million naira properties in parts of Nigeria such as Lagos, Abuja and in some other parts of the world. This may be termed funny, but it is high time EFCC be allowed to beam search light on churches in Nigeria. The corrupt practices ravaging Nigeria like wild fire is stinking to high heavens. From government establishments where officials divert public funds to personal bank accounts, to Academic institution where Vice Chancellors, Rectors and lecturers loot and embezzle. What of so many Public corporations which have been grounded due to poor leadership, to private businesses where operators connive to exploit ordinary Nigerians in order to make huge profits. The Church of God, which is supposed to be above board, is full of unrighteousness and financial mess. True, Some Churches are house of lies, frauds, corruption, materialism, and financial impropriety. 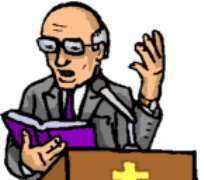 No body wan talk for fear that the pastors will render curses on them. Look around Nigeria, you will find out that almost all available spaces, kiosk, and stores have been converted to money making churches. There are a lot of things wrong in the Christian community in Nigeria that until they are corrected, the church will not have a major impact in the leadership of the country. In many Nigerian churches we find lack of accountability, wrong teachings, fake and false prophesies, self glorification, worship of money and materialism, bribery and corruption, fake miracles, assault and even murder. After all Mrs Obiageli Patricia Chidiac,Imo state born Society Lady was murdered in a church,who knows what happened .Church is now big paying business in Nigeria. It therefore becomes attractive to all Dicks and Harry. One guy I know said he is going to be a pastor.When asked why,he said “church na where the money dey now oo” . No wonder former cinema houses and hotels are being converted to churches in Nigeria, today. The tithe is one of the numerous ways through which pastors steal from church members. They also rob church members through offerings, building project funds and evangelical fund. And increasingly, churches are being set up solely as business concerns rather than to win souls or to depopulate the kingdom of darkness as Pentecostals like to say.EFCC where are you. sometime in December 2007 , the “trendy” and “charismatic” Overseer of Christ Chosen Generation Revival Ministry, Pastor Eze Nnamdi Ofoegbu wrote a petition to the police against the General Overseer of Lord Chosen Charismatic Revival Ministry, Pastor Lazarus Muoka. Ofoegbu demanded the sum of N317 million from his former pastor (Muoka) being what he sank into the church from inception up to the time they parted ways. He said it was an investment, based on an unwritten agreement between them. Ofoegbu said then“What I am asking for is the fulfillment of the agreement we both entered into, an investment into the work of God for which there will be profit and returns. We both agreed that I invest my life savings and that we are going to reap it many fold when the time comes. I believed him and I invested all that I had including the one that did not belong to me. When the time of harvest came he started finding faults with me to embarrass me and frustrate me out of the church. Ofoegbu also said “I am not asking for what I have given to the Lord, far from it. If you have given to the Lord, you have given to the Lord. What you give to the Lord are tithes, and offerings in different forms. Nothing illustrates the greed for money by pastors who run Nigeria's big churches like the story behind the birth of Covenant University, owned by Winners Chapel. When the University was being conceived and built, every church member was expected to contribute meaningfully to the university project fund and during Sunday services, young and old, poor and rich were made to part with their hard earned money because like the offerings and tithes, the church demanded handsome contributions from its members for the project. However, when the university project was completed and the school opened; the school fees pegged at almost half a million naira per semester, effectively ensuring that an overwhelming majority of Winners Chapel members cannot send their children to the Covenant University. It is pastors that have direct access to church funds. Gripped by the desire to make more and more money, churches are diversifying into all kinds of businesses, including outright trading, banking, setting up schools. For example, the Redeemed Christian Church of God owns not just a money-spinning university, it also own New Life Microfinance Bank. Like Bishop David Oyedepo's Winners Chapel, its (RCCG) university is for the rich. Some times,church members watch helplessly in many churches as ministers trade punches and curses at each other over Church- money. They registered the churches in their names with the Corporate Affairs Commission (CAC). Their wives and children are the trustees. So, why should you question the way they run their churches. The church is their personal properties. When will Pastors become accountable .Congregation don't know the total amount of tithes, offering, and pledges collected in their church, or cash at hand or cash at bank, total income and expenditures. Pastors or Church leaders must practice what they preach. They must be honest, holy and righteous. Religious leaders must lead by example and desist from slacking in their obligations to God and their congregation. EFCC should be extended to the churches. Pastors should be made accountable. They should be made to explain where they get money to buy Jets, Flashy and expensive cars, fat bank account, as well as the multi-million naira properties scattered all over the world. Some Pastors in Nigeria have been reported to have up to 30 billion naira in single bank account.EFCC where una dey. We need not forget in a hurry sometime in 2005 when the $4 million provided by renowned American cleric, Evangelist Reinhard Bonnke, for a crusade in Nigeria developed wings. According to reports, those saddled with the responsibility of using the fund to organize a serious evangelical campaign simply pocketed it. EFCC where una dey..
What about the too many fake miracles in churches? Miracles with no proper verification. So many pastors use an electric-shock device that when activated would send shock waves through anyone they touch, making them assume that they had been touched by the Holy Spirit.I know of a cripple in our days in Uniport,that usually stay at the front seat whenever any Big name men of God visit Uniport for crusades. He never get any healing. They use the device to hoodwink unsuspecting members of the public, who regard them as powerful men of God.EFCC where una dey.